The easiest dinner in the world: assorted meats and cheeses. For a wide variety of the aforementioned, we recommend Caputo’s, Pirate-O’s, or Harmons. 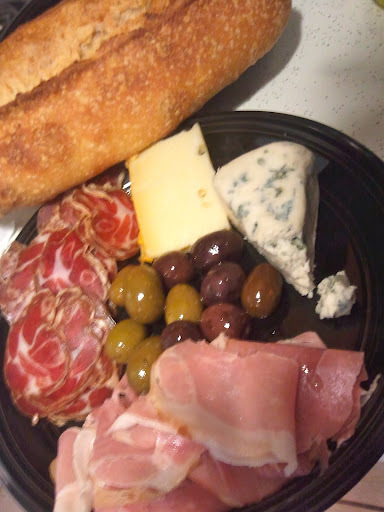 This time we made a quick and easy Harmons run and got some freshly sliced coppa and prosciutto, then added a strong bleu cheese and a sharp gouda to the mix. And we couldn’t resist stopping by the olive bar, where you’re able to mix-and-match an assortment of olives and pay by the pound. We paired it all with a fresh loaf of Harmons’ garlic bread. And what drink goes well with this? I hate to disappoint you, but I paired this with a tall, cold glass of Pepsi Max, 'cause I'm way sophisticated like that.